If there's one thing Spider-Man is good at, it's catching a beating. And if there's one thing toy companies are good at, it's creating variations of popular characters. 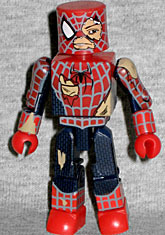 So it should be no surprise that all three Spider-Man movies had Peter Parker getting his costume ripped up, and that Art Asylum would use that opportunity to make a battle-damaged Minimate. This was actually the fourth one,(1 2 3) and the pattern of damage is completely new. The face - what we can see of it - looks very Tobey Maguire-ish and the costume is based on the movie, but the colors are all over the place: the red on his hands and feet is brighter than the red on the torso, which is brighter than the red on his arms. He doesn't look like he was meant to go together. Though he's just called "Sandman" on the packaging, this figure isn't a duplicate of the one from Series 17. He's completely sandy now, with the only paint being the angry, shouting face and the stripes on his shirt (because when you're re-forming your body from the ground up, you want to keep your fashion consistent). He doesn't have legs, but instead a swirling mass of sand. Neat! While he does get the same "powered up" arms as the previous release, there's no green on the sleeves, so you won't get them confused. Depicting Sandman's powers is a really tough thing for a toy to do, but this is a cool way to do it. He also gets a different, less-detailed hair piece. Battle-damaged Spider-Man? Not bad, but still, not a must-buy. 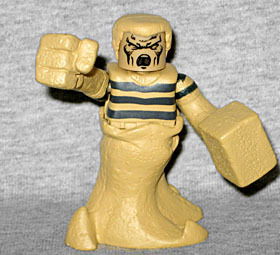 Crazy half-formed Sandman, though? Just a bit awesome. He carries this set by himself.